How do you get started to sell through Amazon Germany? The first step to start selling through any Amazon marketplace is registering as a seller. However, to ensure that you’ll make some good business out of it or expand your business is by creating a professional seller account. What’s the difference between personal seller account and professional seller account? Personal Seller: A personal seller account will only allow you to list products manually. The charge for transaction on sold products is a little bit high if you are a personal seller. This type of selling plan is good only if you are trying to free some space of your garage or attic and get some money for it. Professional Seller: A professional seller plan of Amazon will allow you to list products through bulk listing tools like ExportFeed itself. Also the professional selling plan of ExportFeed will allow you to sell products of over 20 allowed product categories. As a rule of thumb, the target for any seller subscribed to professional seller plan is to sell over 40 items. Reason behind this: To equate the cost incurred as personal seller with the seller fee for the professional seller plan. You are a business owner who’s already selling through your BigCommerce store. Either you want to sell to the customers of Germany to gain stability for your business or you want to expand your business to German online market for increased revenue. 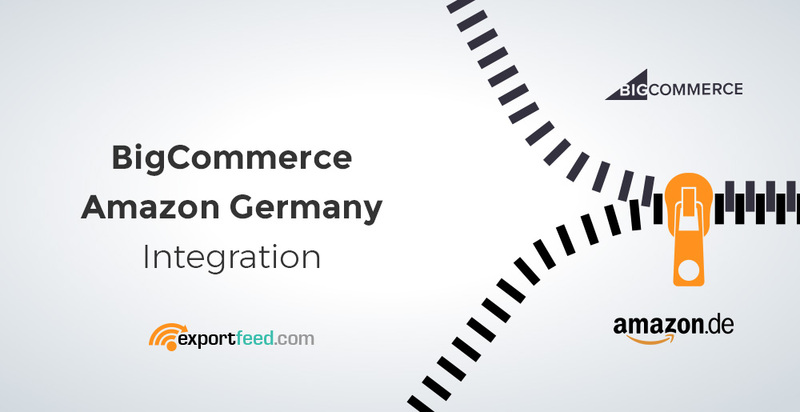 Make sure that your products in BigCommerce store are optimized to grab the attention of customers of Amazon Germany. Whether it is related to the variation products, or the keyword integration on title, or images that are high in resolution to enable the zoom features. Make sure that the GTIN or UPC / EAN are added to your product details and for those products which you have received the exemption, you have set a brand value for them. When you expand your product to sell in another marketplace, you need to perform a proper research on the market, culture and tradition, buying behavior of the customers there and come up with a product positioning strategy. Luckily with the Amazon Germany marketplace you don’t need to work on the positioning strategy, just the BigCommerce to Amazon Germany product category mapping. And even this is handled by ExportFeed app automatically. You need to make sure that your products and product listings are lucrative for the German audience. You can use the advanced commands to optimize the product attributes to meet the information need of Amazon Germany customers. At any Amazon marketplace where the Amazon Prime is available, you need to make sure that the product delivery system needs to be super efficient. And, if you are an international seller selling to the Amazon Germany market, it may get tough if you are not subscribed to the FBA program. However, using some tips like free shipping, discounted prices and offers during special occasions being celebrated by Amazon Germany can help you overcome the setbacks of being an international seller. Tip: Selling through Amazon Germany marketplace will be tough if you don’t have any customer reviews. If you’ve just started to sell through this marketplace, make sure that your target is to gather as many customer reviews as you can. Try our BigCommerce ExportFeed App Now!